Why Recycle Computers and Electronics with Securis? Most businesses do not realize the impact of e-waste on the local and world environments; they simply view their obsolete electronics as trash. That can harm every city on the planet. The electronics we use for business and play contain materials such as antimony, arsenic, lead, and mercury that are unhealthy to us and to our environment. It is surprisingly easy for these materials to ultimately end up in our bodies and cause major issues including lung damage, cancer and seizures. Just one color monitor alone contains 6 ½ pounds of lead and measurable amounts of cadmium, mercury and other toxic metals. At Securis, every part of the electronic asset is recycled in our e-waste recycling programs. Each item is strategically and securely dismantled. All toxic elements are responsibly disposed of, and all remaining metals, plastics, glass and circuitry are processed domestically. It’s a commitment we make to keep everyone and every land health during computer disposal and recycling. What Items are Considered Electronics for E-Waste Recycling? Kitchen appliances and other household electronics can also be recycled. Securis will accept practically anything with a plug as part of our e-waste recycling program. Why Prevent Electronics from Entering a Landfill? Some electronic device components contain constituents that, if improperly handled, could be harmful to the environment and its inhabitants. E-waste that is not recycled ends up in the environment. Water is poisoned, air turns toxic, soil becomes dead, and wildlife and plant life suffer. Certain components of electronics contain measurable amounts of regulated heavy metals, including lead, silver, barium, cadmium and mercury. Many of these metals can be recovered and responsibly disposed of, based upon EPA standards. How Will Recycling My Obsolete Computer and/or Electronic Equipment Make a Difference? Securis wants to help change this for the good of our local and global environments. What Are the Outcomes If We Dispose of Electronics Improperly? A NOTICE OF VIOLATION can be issued by the Resource Conservation and Recovery Act. Failure to correct the alleged violations cited required by this NOTICE may result in the assessment of penalties, not to exceed $27,500 per violation pursuant to Section 3008 of Resource Conservation and Recovery Act (RCRA) of 1976, 42 U.S.C. § 6928. What About Donating My Electronic Assets? Donation programs can work well if all involved parties understand the limits and liabilities associated with the transfer of equipment. Questions such as, “Who will ensure that proprietary data is eliminated before the donation?”? need to be answered prior to ownership transfer. The Gramm-Leach-Bliley Act of 1993, Health Insurance Portability and Accountability Act (HIPAA) and many other state and federal laws make all companies and organizational entities legally responsible for the protection of client privacy. Failure to effectively destroy all informational data prior to the transfer of ownership leaves an organization open to corporate liability. Securis Data Destruction process helps eliminate the worry of such a risk. 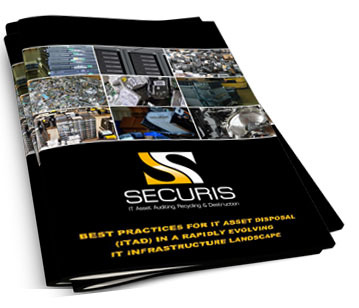 How Does Securis Pay for Used IT Equipment? Secusis provides a revolutionary customer rebate program that’s simply the best in the industry. What makes it better? Securis offers customers complete transparency into each item we recycle and destroy. You’ll get access to our customer portal, where you’ll see a full list of the equipment, the date sold, the sales price and how much you’ve earned. We think you’ll be surprised at the residual value in some of the equipment you’ve paid to recycle in the past. Why Does it Cost Money to Recycle Some Electronics? While we do our best to be sure each customer receives the maximum value from each repurposed and scrapped piece of IT equipment, there are certain items that cost us to properly dispose of, such as some televisions and monitors (see a full list of acceptable items and fees here). Materials such as antimony, arsenic, lead, and mercury used to manufacture electronics are unhealthy to us. If not recycled properly, it is surprisingly easy for these materials to ultimately end up in our bodies and cause major issues including lung damage, cancer, and seizures. E-waste that is not recycled ends up in the environment. Water is poisoned, air turns toxic, soil becomes dead, and wildlife and plant life suffer. To avoid these harmful effects on both our bodies and our environment, reputable e-cycling companies provide outlets for responsible riddance of your old electronics. Unfortunately, some companies lower their costs by exporting e-waste to countries like Ghana, Nigeria, Pakistan, India, and China where it gets broken down by men, women, and children who are usually unprotected from the toxins. Securis just doesn’t believe that is how the process should be handled. We focus on proper disposal and e-waste recycling that’s safe and doesn’t put the less-fortunate at risk.